The year 1962-63 is considered to be the most important not only for Bhojpuri but for Maithili cinema as well, as it was during this time that the epoch-making attempts were made and initiatives were taken to make the first film in either language. 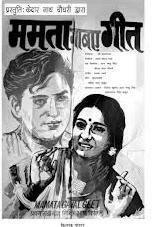 Mamta Gabay Geet is the first Maithili film which started in 1962-63 but it had to witness several ups and downs from start of the film in 1962 to its final finish in 1981 and finally it was released much more lately after long hiatus of 19 years. Before it was released in 1981, another Maithili film Kanyadan, directed by Phani Majumdar based on the novels of Harimohan Jha , came up on the big screen in 1965. Coming to Mamta Gabay Geet, it is worth mentioning that Mahant Madan Mohan Das, Kedar Nath Chaudhary , the producer duo of the film, and later Uday Bhanu Singh and film Director C. Parmanand started the project. It had music by Shyam Sharma (Shyam Sagar) and lyrics by Rabindra Nath Thakur (Rabindra-Mahindra-duo). Its first name was Naihar Bhel Mor Sasur but its name was changed in due course. The muhurt of the film was conducted in 1962(?) in Hindi Sahitya Sammelan held in Patna. Pyare Lal Sahay, Tridip Kumar, Azra, Kamal Nath Singh Thakur etc were the lead actors. Due to the differences among the partners the film was stopped. Thanks to Rabindra Nath Thakur, the film was re-made and released. However, during its remaking some more scenes were added, in addition to the changes made in the sub plot. Hence, some more names of the casts were added like Prem Lata Mishra Prem, Lalitesh, Ash Narayan Mishra etc. The music and songs of the film are outstanding and soulful as the famous singers of the time like Geeta Dutta, Mahendra Kapoor, Suman Kalyanpur, Usha Timoti and Shyam Sharma had given their sweet voice to the beautiful wordings penned by noted poet lyricist Rabindra Nath Thakur. Another notable fact attached with the film is that actors Sunil Dutta and Rajendra Kumar, bosom friend of C. Parmanand had spared their famous studios- Ajanta Studio and Dimple Studio respectively- for shooting of the film, though major portion was shot in Rajnagar. Mobile no of Sri Kedar Nath Choudhary.....08809660611/09334930715 The writer of AAWARA NAHITAN for full and authentic details of MAMTA GABAY GEET. Sorry for reputation because mob.no was erroneously left. Sri Kedar Nath Choudhary one of the co-producers of MAMTA GABE GEET is still available at mobile no:- 08809660611.at the given address for authentic details. Apne thik likhal film k nirmnak kalpana (aab Swargiy)Mahanth Mohan Das aur Sri Kedar Nath Choudhary k chhalain baad me Uday Bhanu Sinhg join kaylah.Tinu gota k patrnership me.Film banala k baad ditributor k khoj me hatotsahit bh k Mahanthji aur Kedar Babu wapas aabi gela.Film parda par naee pahuchal.Baad me Rabindra ji film k adhikar prapt kayala,sansodhan kela.Film parda par aayal. Pura kahani Sri Kedar Nath Choudhary,Hidden Cottage,Bangali Toal,Laheriasarai,Darbhanga likhit pustak "AAWARA NAHITAN" me achhi. Apnek prasak jatek prasansa kail jay wo thor .Ai filmak CD/DVD/KONO ROOPAK AUDIO,VISUAL KONA VETTAI SE KHABARI KARBAK KRIPA KARAB. Nice to see this article here, music director of this film is my father Late Shree Shyam Sharma (Shyam Saagar).. Thanx a million for uploading. Pleased to introduce our selves as child artist of the film. Bihari nagri main shor.... Was pacturised on me. Can I can get CD/DVD of this film. Thank you so much for the article Bhaskaranand ji. However I would like to let you know that there were no differences between the director duo and would request you to read a book "Awara Nahitan" by Kedar Nath Chaudhary to get the facts clear. The book has recently been published. Please feel free to contact me for any further queries.